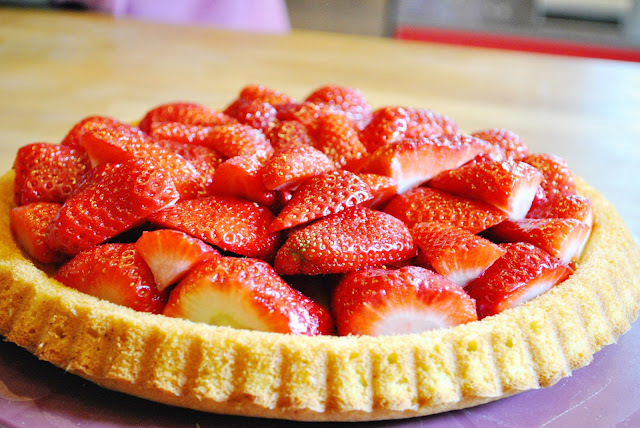 Hi everybody!How's your weekend so far?I'm spending the weekend at my parents house and one of my favorite things to do with my mum is baking!Since strawberries are popping everywhere this time of year we decided to make a strawberry tart.For me it's the best light spring dessert!I thought I share the recipe with you in case anyone is interested in making one! 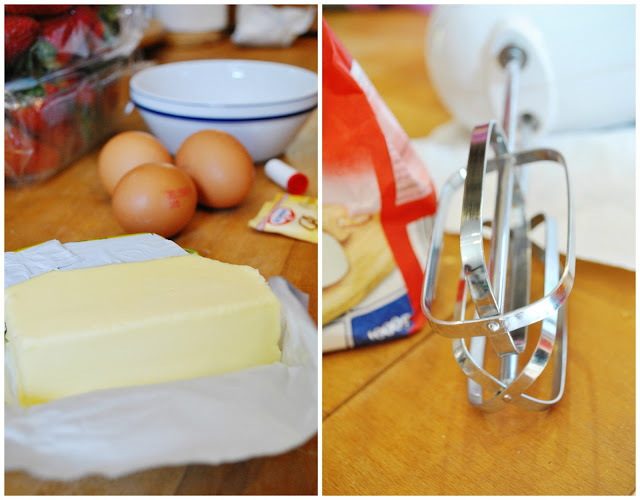 1.Preheat oven to 175-200 C.
2.Cream the butter until light and fluffy,add the sugar,the vanilla and the eggs. 3.Mix together the flour and the baking powder.Add to the first mixture,add the milk(sorry forgot to take a photo of this step).Whisk until you have a soft batter. 4.Grease a tart baking pan and use a spatula to distribute the batter evenly on the form. 5.Bake at 175-200 C for 20'.Check it with a toothpick after 15',if it comes out clean it's ready(do not over bake-it has to be just slightly brown around the edges).Let it cool slightly. 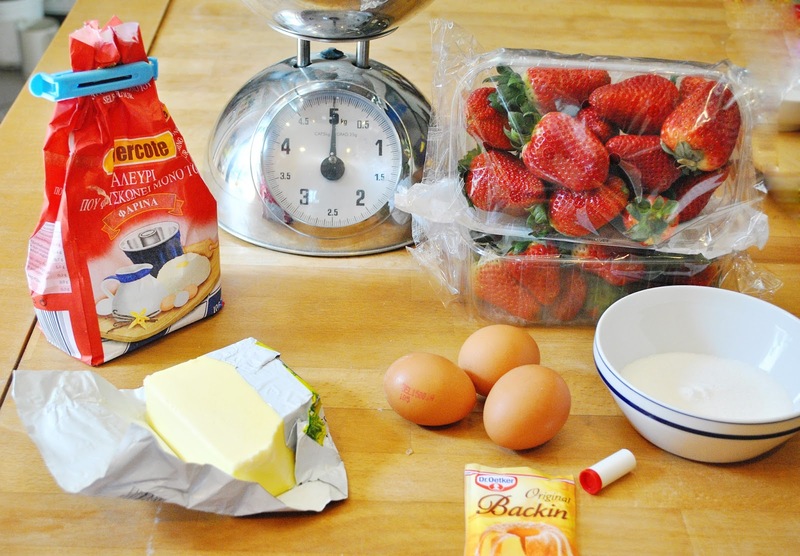 6.Turn it upside down on a cake stand or plate,arrange the strawberries on top(cut in half-or however you like them).Make the tortenguss(or the strawberry gelatin) according to the instruction.Add on top of the tart.If you'd like,you can add some cream or yogurt on top of the tart base,before placing the strawberries. 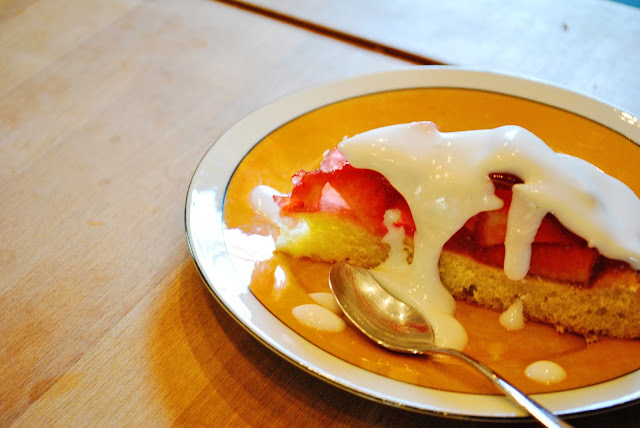 You can serve it as it is or add some whipped cream!We chose an almond milk whipped cream! Yes!I definitely recommend it!Perfect spring dessert!